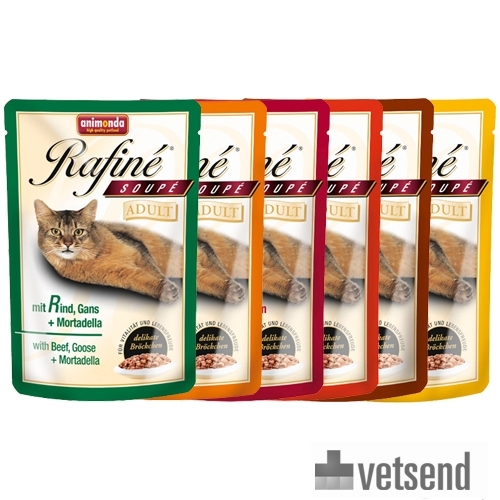 Animonda Rafiné Soupé Adult is a wet food for adult cats, with tasty chunks in sauce. Animonda Rafiné Soupé Adult - Poultry in Cream Sauce - 12x100 gr. The meat chunks are served in individual portions and contain no sugar, soy, artificial colourings or preservatives. Turkey, veal and cheese: Meat and animal derivatives (20% turkey, 10% veal), milk and dairy products (4% cheese), vegetable products, minerals. Poultry, Rabbit & Ham: Meat and animal derivatives (20% poultry, 10% rabbit, 4% ham), vegetable products, minerals. Chicken, Duck & Noodles: Meat and animal derivatives (20% chicken, 10% duck), cereals (4% noodles), vegetable products, minerals. Beef, Goose & Mortadella: Meat and animal derivatives (8% beef, 8% goose, 8% mortadella), vegetable products, minerals. Poultry in Cream Sauce: Meat and animal derivatives (15% poultry), milk and dairy products (1% cream), grains and minerals. Veal in Gravy: Meat and animal derivatives (8% veal), vegetable products, minerals. Have you used Animonda Rafiné Soupé Adult before? Let us know what you think about this product.